1. First beat the Eggs in a bowl. Egg yolk we can use it or avoid it, either ways. After beating the egg add Salt, l, little pepper powder and make Egg scramble. Once the Egg scramble is ready keep it aside. 2. 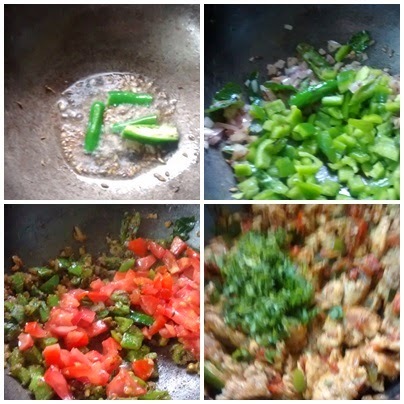 Chop the Onions, slit Green chillies, grate Ginger and chop capsicum in cubes... Take a pan, pour oil in it. Add Garlic, Ginger and Green chili, sauté for few seconds. Next add the Onions, sauté it till Onions becomes transparent followed by capsicum. 3. Now add the Chili powder, pav bhaji masala powder and stir in well. Tomatoes are to be added last for not making it mushy. Check salt as required in between. 4. Stir well for 1 minute so that the masalas mix well with the other ingredients. Remember not to add water, as we are making it dry. 5. Now add the Egg scramble into this and mix well. Add some more pepper powder if you want it spicy. Stir well for few seconds and switch of the stove. 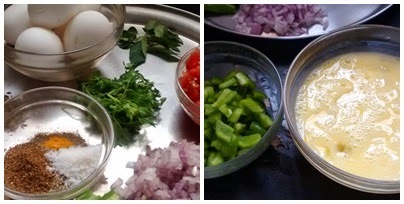 Garnish with Coriander leaves and the dish is ready to be served. Garam masala can also be added in place of pav bhaji masala. It is a spice blend (found in Indian stores) used for a specific recipe called Pav bhaji where the mashed vegetables are served with buttered buns. 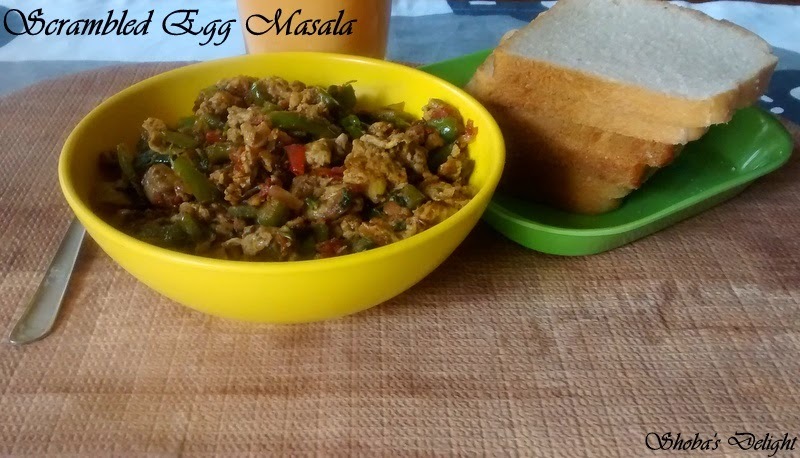 Adding it to scrambled eggs is always equally awesome but adding garam masala is absolutely perfect too. Add curry leaves after the oil is heated. You could also add any cooked vegetable to make a meal out of it. I am feeling happy to be invited by Ramya Venkateswaran. 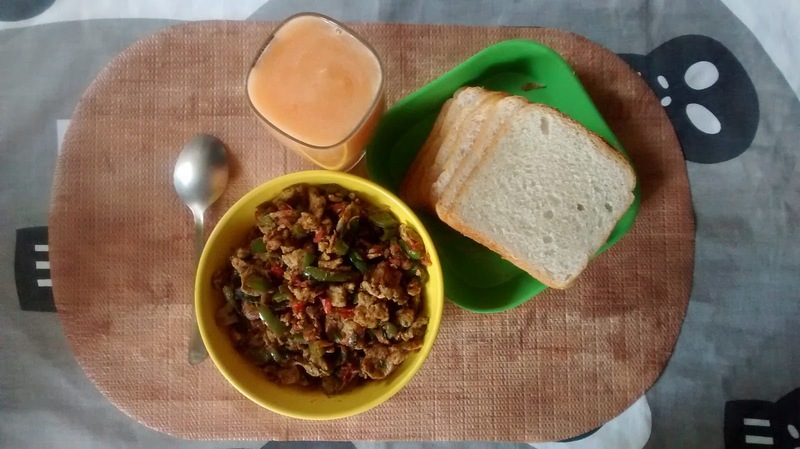 This is the first time in my blogging field I am posting my recipe in some one’s space. Such is such a lovely girl and I always consider her like my sister.She does lots of recipes and baking too of course in a very fantastic way.She participates in lots of events and enjoys her blogging. No need to say more about her as everyone in blogging knows this. 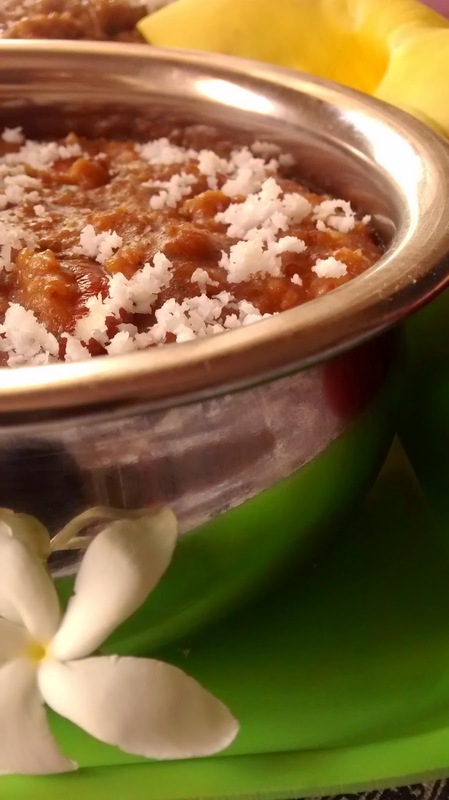 Try this healthy and quick version of sweet pongal using Oats. It is tasty and you get the nutritional benefits of whole grains too. 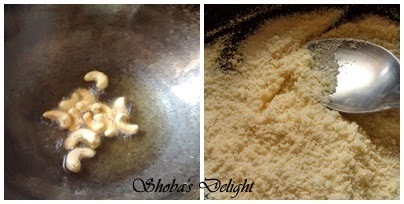 I thought of posting a festive sweet recipe for Aadi velli. So here goes the traditional sweet recipe in a different way. So I replaced the rice with Oats. It’s a quick fix, healthy meal. I tried the sweet pongal (chakkarai pongal) using quick cooking oats and told me that it tasted very good. It’s a nice and healthy change from the regular white rice pongal. I will post the savory oats pongal recipe too here shortly for the benefit of those who have not tried it so far. Try making pongal with oats and I’m sure you will enjoy it. 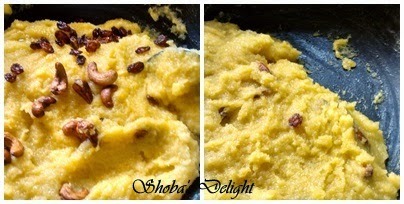 Please Visit her space at www.lemonkurry.com for the detailed version of Oats Sweet pongal…. Catch you guys with my next post soon. Ginger and Garlic aids in digestion when we add in our food. But, it is an essential ingredient in every home and most of our Indian dishes have Ginger Garlic Paste in it. Ginger Garlic Paste recipe doesn’t require much introduction since everyone knows that it is very simple to do. I found the fresh flavor in it, which we cannot see in store bought bottles. I don't feel comfortable with store brought ginger garlic paste. I feel it is less flavorful and the taste is not that fresh. It is easier for week day cooking if you have it handy. It’s really quick to make and a little goes a long way. 1. Wash and clean ginger in water well twice or thrice, until the skin looks clean. Once you finished washing, let it dry. Then, wipe it dry with a clean kitchen towel .Peel off the skin of the ginger and roughly chop into small pieces.Peel the skin of the garlic and chop it roughly. You trim or cut the head of the garlic pods, so that we feel easy to peel the skin. 2. Now add chopped ginger, chopped garlic, salt, turmeric powder and oil in mixer jar and grind it to a smooth paste. 2-3 teaspoons of water if necessary, to loosen the solids in the blender.Use clean dry spoon to scrap the sides of the mixer jar.Once finished grinding it to smooth, transfer it to a clean dry bottle or airtight containers and refrigerate it. 3. Whenever you take Ginger Garlic Paste out of refrigerator, use dry spoon to take it from bottle. Store in sterilized glass jar in the fridge. Use clean, dry spoon and store in clean, dry glass bottle or box and refrigerate. I am so happy to have her recipe in my blog. She wanted to post her recipe for my blog anniversary. Such is such a lovely girl and I always consider her like my sister.She does lots of recipes and baking too of course in a very fantastic way.She participates in lots of events and enjoys her blogging.Her total inspiration is her mother and now her hubby for sure.He too very supportive for her and I am happy and wishing her all the best in the future. 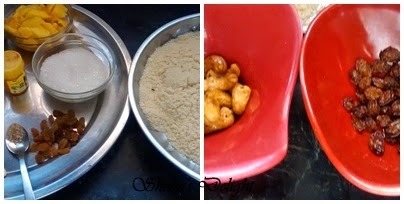 Here My blogging sister Ramya talks about me and her twisted recipe. Today am here in my most lovable one’s home where she means a lot to me. We both came to know through Facebook and we were chatting through phone for past almost a year. She is for me like a sister. But if I say her madam, she will kill me from Bangalore itself. We talk about so many things like about blogging 101, cooking interesting combinations and beyond blogging too. She is the Mom of 2 kids and no can guess she is a Mom of two kids. I really excited to see her recipes with healthy scrumptious combos. I decided to do her guest post for her Blog Anniversary, so I selected this sago pudding recipe. This is yet a simple one but with a scoop of ice cream which tastes super yummy. I dedicate this scrumptious dessert to her blog Anniversary and wishing her many more to come. This is the simple sabudhana kheer but I give a little twist to the recipe by adding ice-cream to hot kheer and this tastes super delicious while serving chill. 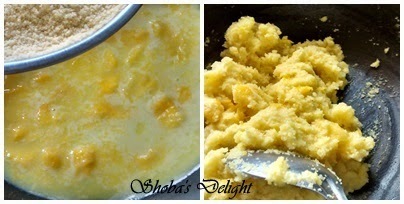 Sabudhana or sago does not need to soak, cook in milk plus water combination and add sugar in last minute and then relish with the scoop of ice-cream. This is a fusion dessert where you can serve it in any serving method either in shot glass, parfait glass or in a bowl too. I served this yummy treat in a glass and here comes the method and preparation. · Heat oil in the sauce pan and add sago and roast it in medium flame. Otherwise it will burn at bottom. · Add water to it and cook until it enlarges and transparent. Then add a cup of milk to it and cook until the water evaporates and it will get thick a bit. 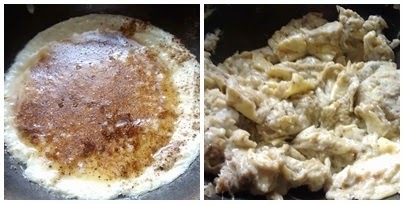 · Add cardamom powder and add mix well. Switch off the flame and cool until it came to room temperature. · Then transfer it to serving vessel. I used glass so I filled quarter with kheer and then topped with ice-cream. · Serve chill for better results. You did not need condensed milk in the recipe as the sago itself a thickening agent so there is no need to add it. You can also replace regular sugar with palm sugar. Mango kesari is just like regular Kesaribath except the part that it has ripen mangoes and the mango pulp in it to bring out a complete superior grand taste. Mangoes are always my weakness! !I keep waiting for the mango season to arrive. Though i was not welcoming the idea in the beginning, this turned out to be really flavorful fudge like dessert. Choose ripe sweet mangoes or good quality sweet mango puree for better results. I have used fresh mangoes, we can also use canned mango pulp. It was one of the quickest to prepare and very delicious too. Mango Kesari bath apart from being finger licking delicacy can be as a dessert or as prasadam / naivedhyam. Wash and clean the mango. Peel the rind and cut into small pieces. (These pieces will be for sautéing).Keep it aside. Take the peeled mango which already you have made it ready.Blend in amixer by adding little water.Scrape the corner and give a quick stir for a smooth pulp.Place it aside. 1. In a non-stick pan, roast cashews and raisins using one spoon of ghee.Once roast,Keep it aside.In the same pan,roast rava till it turns slight brownish in color.Keep it aside in a separate plate. 2. In the pan add the required quantity of water. Bring it to a boil and add cut ripen mangoes . Lower the flame of the stove. Add color (yellow) which has to be dissolved with the milk and pour back into the boiling pan. 3. Add roasted rava to the boiling water little by little with constant stirring and mix well so that there are no lumps. 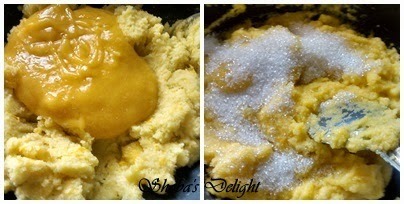 The mixture turns little liquid and then begins to solidify. By this time rava would have cooked well. 4. Now add the blended mango pulp. Keep adding and mixing till all the mango puree is incorporated into the rava. Before adding sugar taste the pulp. If it is sweeter then reduce the required amount of sugar. 5. After few minutes, add ghee to make sure the rava doesn’t stick to pan. Add cardamom powder and all the roasted nuts. Give it a good stir. 6. Pour into a greased tray. Cut into desired shapes or just scoop into serving dessert bowls and garnish with remaining cashew and raisins. Mango Kesari is ready to be served either hot or cold. You can also add grated pista and almonds. Add sugar only after rava gets cooked well. Try to break the lumps when the mixture is semi solid. 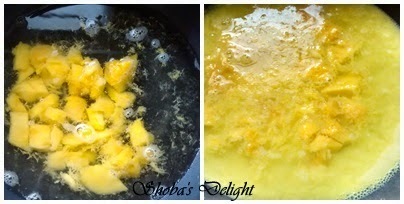 The mixture solidifies after some time and so switch off the flame when the mixture is little semi solid.It is optional and depends upon the color of your mango pulp. If your mango pulp is dark then avoid adding the color. 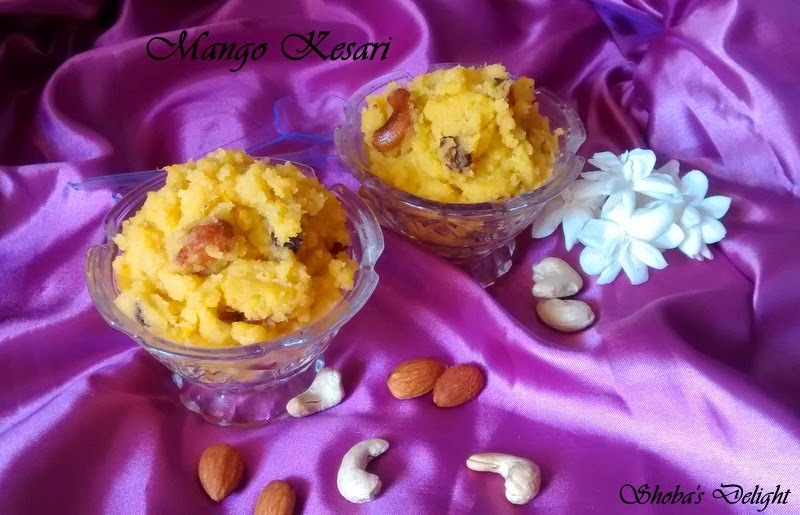 …..I am happy to post a special recipe Mango Kesari for my first blog anniversary !! Thank u readers for your overwhelming support and encouragement. 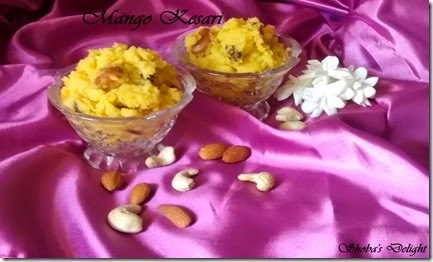 Technorati Tags: Mango Recipes.,Kesari recipes,Mango kesari recipes,Dessert recipes,Kids delight.,Milk recipes,Cardamom recipes,Nuts recipes,Cashews and almond recipes. Beetroots are an excellent source of folic acid. Beetroot is rich in fiber, exerting favorable effects on bowel function, which may assist in preventing constipation and help to lower cholesterol levels too.Having beetroot every day can help reduce one’s blood pressure. 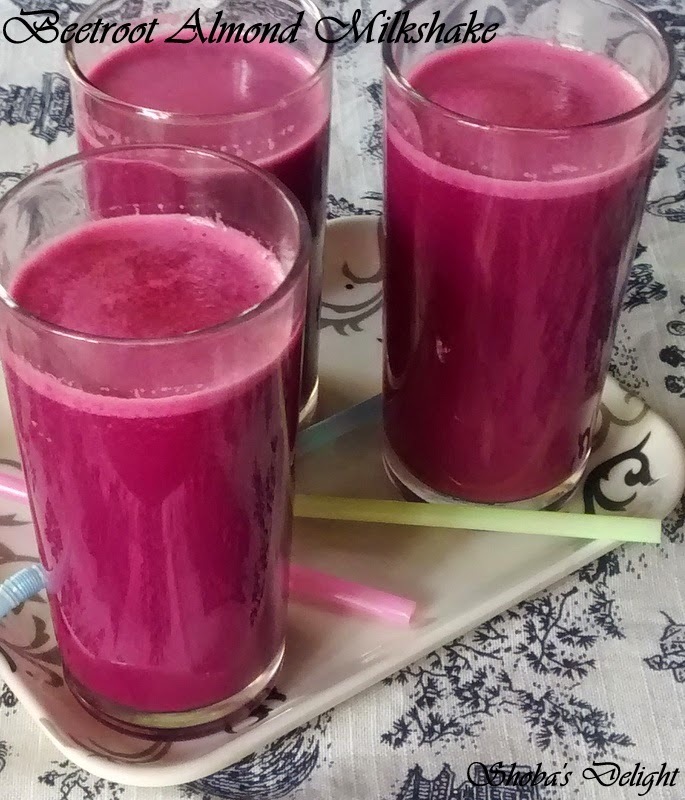 Along with having numerous health benefits, beet root is also beneficial for the skin.Yummy to taste this beetroot milkshake with cinnamon and strawberry ice cream is sure to win hearts. Nuts on the other hand everyone knows about it. Sugar –as per ur taste. 1. Take raw beetroot and cut it into pieces. In a blender puree the beetroot with strawberry ice cream. Blanch the almonds and keep it ready for use. In a blender add sugar, blanched almonds, crushed ice cubes and milk . 2. Whip the blender till you get a smooth and a beet color milkshake. Check for sugar as beetroot itself will be very sweet by nature.Lastly,add cinnamon powder for a strong flavor. Serve chilled in glasses. Add whipped cream if possible which gives a lovely taste. But it is completely optional. a. Beetroots can be eaten raw or cooked.Older beetroot tends to have lost its sugars, which turn to starch. b. Fresh, unblemished beetroot will store for 10 days or so in a refrigerator crisper.Remove the stalks and keep these in a separate bag (these can be eaten too). 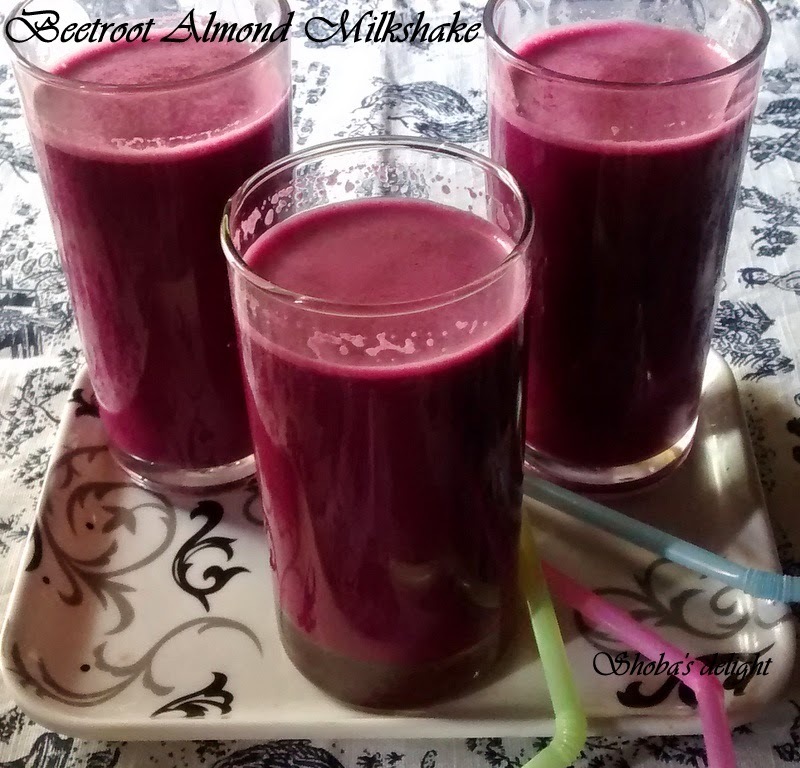 Technorati Tags: Beetroot milkshake recipes,Milkshake recipes,Beetroot recipes,Kids delight.,Healthy milkshake recipes,Vitamin recipes.